With the mobile update, users can no longer view separate feeds of Top News and Most Recent Feeds. The news feed shows, in the following order, Top Stories, Recent Stories and "From Earlier Today." 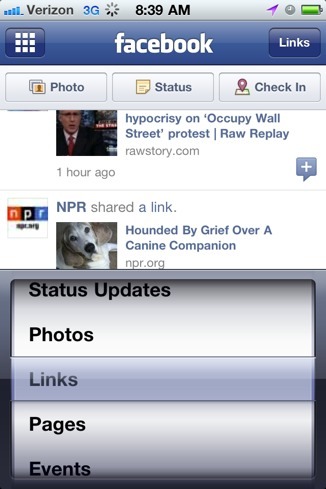 However, you can still sort the feed by type of update, including Status Updates, Photos and Links using Smart Lists. Top stories are identified by the the blue triangle in the top left corner. Recent Stories follow below the Top Stories to keep you up-to-date with what your friends are saying. From Earlier Today is a combination of Top Stories and Recent Stories. Users can sort the feed by Photos, Links, Events and more. 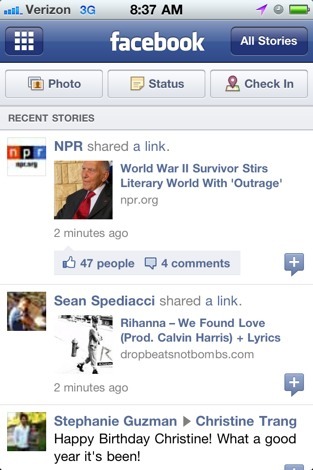 In this example, click "Links" in the top right corner to open the news feed filter options.